Buddy breathing is a rescue technique used in scuba diving "out of gas" emergencies, when two divers share one demand valve, alternately breathing from it. Techniques have been developed for buddy breathing from both twin-hose and single hose regulators, but to a large extent it has been superseded by safer and more reliable techniques using additional equipment, such as the use of a bailout cylinder or breathing through a secondary demand valve on the rescuer's regulator. Running out of breathing gas most commonly happens as a result of poor gas management. It can also happen due to unforeseen exertion or breathing equipment failure. Equipment failure resulting in the loss of all gas could be caused by failure of a pressure retaining component such as an O-ring or hose in the regulator or, in cold conditions, a freezing of water in the regulator resulting in a free flow from the demand valve. 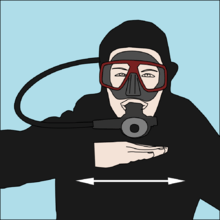 Buddy breathing is usually initialised by the diver with the "out of air" emergency signalling this to another diver by a standard hand signal "give me air". This signal is made by holding the fingers and thumb of one hand together, pointing them at the mouth and making repeated movements of the finger tips towards the mouth. The donor is expected to take a good breath and pass his/her demand valve (or mouthpiece in the case of a twin-hose regulator) to the recipient, who is expected to take two good breaths and pass it back. In reality the recipient will often take more than two breaths, and the donor should expect this and relax to minimize metabolic rate. The donor should retain a good grip on the demand valve throughout the buddy breathing process, as a panicked recipient may fail to give it back. A reasonably reliable way of keeping control of the demand valve is to grasp the hose firmly in the fist where it connects to the demand valve. This provides good control but allows the recipient to use the purge button if needed. A pattern of two breaths per diver should be established as soon as possible and then terminate the dive and start the ascent as soon as possible, as air consumption while buddy breathing is usually more than double the normal rate. Most demand valves will only drain correctly if the hose is to the user's right, and in these cases the divers should align themselves to allow convenient movement of the demand valve from donor to recipient and back. When the divers need to ascend or swim horizontally, it requires co-ordination and some skill, which is best practiced in a low hazard environment. A study by the UCLA Diving Safety Research Project suggests that about 20 successful repetitions of buddy breathing during training of entry level students are needed for a reasonable expectation of success without errors, and retesting after three months without reinforcing practice showed degraded performance and procedural errors. This is a higher level of training than provided by most recreational diver training organisations. For the skill to be reliable in an emergency, periodic reinforcement is necessary, and familiarisation is particularly valuable when buddies are to dive together for the first time. Buddy breathing originated from military diving following a prohibition on the training and practice of free ascents. Most recreational and professional diver training organisations would consider relying on buddy breathing from a single regulator as an unacceptable risk, as the use of a secondary demand valve (octopus) or second regulator, either from an alternative scuba cylinder, or from the primary scuba set, is a far more reliable and safe method of supplying emergency air to a diver who is part of a planned team or buddy dive, and a solo diver should carry his/her own emergency gas supply. 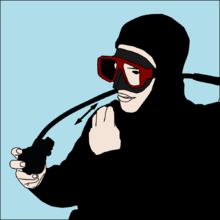 There should never be a situation on a well planned and executed dive where two divers need to share a single demand valve, but the technique is still considered useful by some diving schools as it teaches control and hones skills under difficult circumstances. Buddy breathing is discouraged by many training agencies because other more reliable techniques and equipment exist. The technique needs training and regular practice by both divers if it is to be used successfully in a crisis; panic and task loading being the main reasons for it failing. Especially in situations in which one or both of the participants are not well-trained in the technique, the procedure has been criticised for endangering two people instead of one. Many divers fit a second demand valve, often called an "octopus", to their diving regulators, for emergency use by another diver. Some go so far as to recognise that the out-of-air diver will want the demand valve they are breathing off at the time, as it is indisputably providing breathing gas, and almost certainly a gas suitable for the current depth. These practice "donating the primary" in recognition of this tendency, and often use an extra-long hose (up to 7 ft long) to facilitate the procedure in tight spaces. These divers often wear the secondary demand valve on a "necklace" which keeps it ready for immediate use under the diver's chin, where it can be retrieved for use without the use of the hands. Divers doing deep diving, cave or wreck penetration, or decompression stops may routinely carry a complete, independent bailout scuba set for their own or their buddy's emergency use. This is particularly prevalent in professional diving operations where it is often mandatory. Use of other emergency air sources such as octopus second stage, integrated DV/BC inflator units, bailout cylinders etc. also requires the learning of appropriate skills. These procedures are as complex as buddy breathing up to the point of sharing, and the fundamental difference is that the donor and recipient are not required to alternate breathing with a period when no air is available, which can be a big advantage. These alternatives to buddy breathing also require substantial learning and reinforcement to be reliable in a stressful situation. Mike Harding's eponymous melancholic song Buddy Breathing uses the image of the diving technique as a multilayered metaphor for love, especially of the need to trust your partner in such a risky territory as a relationship. ↑ Denoble, PJ; Marroni, A; Vann, RD (2011). Annual Fatality Rates and Associated Risk Factors for Recreational Scuba Diving In: Vann RD, Lang MA, eds. Recreational Diving Fatalities. Proceedings of the Divers Alert Network 2010 April 8-10 Workshop. Divers Alert Network. ISBN 978-0-615-54812-8. ↑ Watson, Jim (2013). "Regulator freezes". Diving safety: Safety talk: 2013 listing. Ellesmere Port, Cheshire: British Sub-Aqua Club. Retrieved 30 November 2016. ↑ Ward, Mike (9 April 2014). "Scuba Regulator Freezing Chilling Facts & Risks Associated with Cold Water Diving" (PDF). DL-Regulator Freeze Research Study. Panama City Beach, Florida: Dive Lab, Inc. Retrieved 30 November 2016. ↑ "Dive Links". Retrieved 2009-04-14. 1 2 "Underwater Signals - UKDivers.net". Retrieved 2009-04-14. 1 2 3 4 5 6 Egstrom, Glen H (1992). "Emergency air sharing". South Pacific Underwater Medicine Society Journal. 22 (4). Retrieved 2013-12-18. 1 2 Mike Busuttili; Mike Holbrook; Gordon Ridley; Mike Todd, eds. (1985). Sport diving: The British Sub-Aqua Club Diving Manual (Revised ed.). London: Stanley Paul. ISBN 0-09-163831-3. ↑ Graver, Dennis (2003). Scuba Diving (3rd ed.). p. 88. ↑ Sheldrake, S; Pedersen, R; Schulze, C; Donohue, S; Humphrey, A (2011). "Use of Tethered Scuba for Scientific Diving". In: Pollock NW, ed. Diving for Science 2011. Proceedings of the American Academy of Underwater Sciences 30th Symposium.